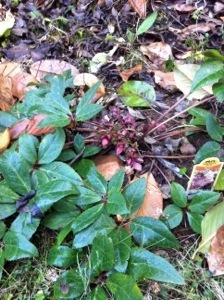 We experienced a major cold snap last year, which most of my plants have now recovered from. Buds are setting on everything from the blue elderberry that was much hindered, I think, from its original placement on the parking strip (since moved to the yard), to the new persimmon tree, aronia, western crabapple, and red elderberry. 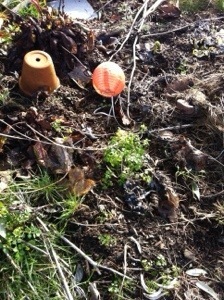 My strawberries sent out lots of shoots, and the new plants have taken hold of the earth. 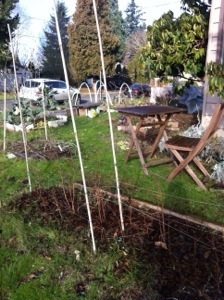 And my winter broccolis and kale seems to be doing ok. 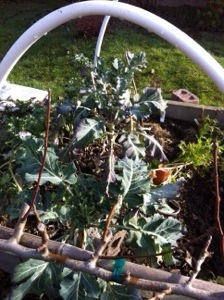 The kale has started budding new leaves where I had cut. Miraculous plant! Tall Oregon Grapes I planted in the fall are doing great under the Doug Fir. 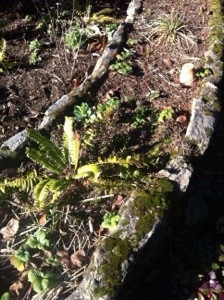 Snapshot of the winter garden. Today we had lovely sun and temps in the 50s. See that chair? I was sitting in it this afternoon with a glass of bourbon in the sun. Chervil? 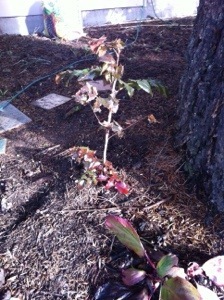 Did I even plant that last year (looking it up…)? Yes I did! In May! Apparently this lovely little anise scented bit of deliciousness either set seed or survived as a perennial. How elegant. Out with the old, in with the new. When I moved to Portland without the experience of having my own garden, a butterfly bush sounded like the most dreamy thing ever. Well, this non-seed setting safety net guy was a big disappointment in 2013 (this plant can be invasive…mine is sterile). The flowers were meh, and it just gets in the way. I’d like to replace this with a mock orange native. The Hellebores are back! How can you not love a black flower, right? 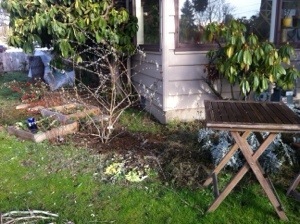 Okay, so my native area #2 is in need of improvement…I realized this when I got the email for the spring native plant sale, courtesy of the East Multnomah Soil and Water Conservation District. 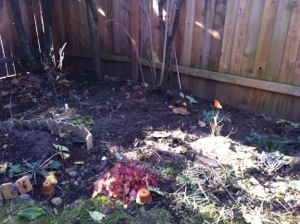 I plan to add some evergreen huckleberries to this area. I have two strawberry areas. This is where the (looking it up in my journal…) seascape? sent out lots of runners. 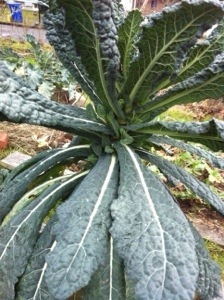 The winter broccoli is doing ok. This bed is meh. The ones in Bed #1 circle are doing better.